Persistent store (SQL Server). Entity Framework. Code first. Code first migrations. View model classes. Last week, we used the server’s memory to store data for our web service. Today, you will learn to use a persistent store. The best match for a web service built on ASP.NET Web API is SQL Server. The ASP.NET runtime engine enables an app to use a “local” database, or a conventional database server located somewhere in the IT infrastructure. For the few weeks, we will use a “local” database. A local database appears as an .mdf file, in the project’s App_Data folder. When your app is active, the ASP.NET runtime engine starts a database engine to manage the interaction with the database. If we configure the pieces correctly, then all of this is done auto-magically. Later in the course, we will use a conventional database server to store our data. More on that later. We will take advantage of the knowledge and experience that you gained last week. Recall that you learned a recommended approach to building an ASP.NET Web API web service, by creating data classes, a data initializer, and a data service or manager class. We’ll modify that approach, to accommodate the persistent store. The table below compares last week’s approach – the ‘In-memory store’ – with today’s new approach, ‘Persistent store (RDBMS)’. You can think of the following as how-to-assemble list, or a recipe for an app. Modern ASP.NET web apps and web services use Entity Framework (EF) technologies for data persistence. Almost all students in this (Fall 2013) course have learned something about the EF technologies. Here’s a list of links to overviews and information about EF technologies. The bottom line is that the process we started using – creating our app domain data model classes in the models folder (in a source code file named AppDomainClasses.cs) – is the process that we will continue to follow. The following sections take you through the items in the right side of the table above. No changes here – it works the same way. However, there are a few ideas to remember. When you write a data class that includes a collection property, you must write a default constructor. In the constructor, you must initialize the collection property. While you’re in the constructor, if you wish, you can create default values for other properties. Looking at the other side of the collection property, when you write a class that’s associated with another class, add a property for that class. Later, you will use data annotations to improve your app domain data model. If you intend to use a persistent store (i.e. a relational database management system), your app needs a connection string. In your app, it is stored in the Web.config source code file. To create a new connection string, a simple method is to copy then paste the existing connection string, and then edit the new one. There are a few important parts of the connection string. The value of the “name” attribute is very important. We will use it in our app’s code. In the image below, it is highlighted by the red-bordered rectangle. Next, in the “connectionString” attribute, the value of the “AttachDbFilename” item is important. It tells you where the store file will be located. The ” |DataDirectory| ” string is mapped to the “App_Data” folder. In the image below, it is highlighted by the green-bordered rectangle. Finally, the “Initial Catalog” item is important. It has the actual name of the database. We do not use it in our code, but you may use it if you use one of the management tools. In the image below, it is highlighted by the grey-coloured rectangle. A “data context” is a class that functions as the gateway to the database platform. The purpose of the store initializer remains the same – add initial data to your data store. It inherits from a “database initializer” (specifically,DropCreateDatabaseIfModelChanges<TContext>). As a result, it has more capabilities than last week’s store initializer. It does not have a constructor. Instead, you implement the Seed method, which effectively has the same purpose as the constructor in your past examples. The purpose of the manager remains the same – provide access to your app’s data and data-related functionality. It declares and initializes a reference to the app’s data context. Its operations work on TEntity objects and collections. We need to talk about view model classes. They take on the exact shape of the data you wish to work with in a view (as defined in the model-view-controller architecture). The properties in a view model class are based on the properties in an app domain model class. Our goal is to prevent app domain model classes from being visible and accessible in controllers and views. Instead, in controllers and views, we will use view model classes. This implies that we must map data between app domain model classes, and view model classes. Create a new folder, named “ViewModels”. Create a new source code file for a class. 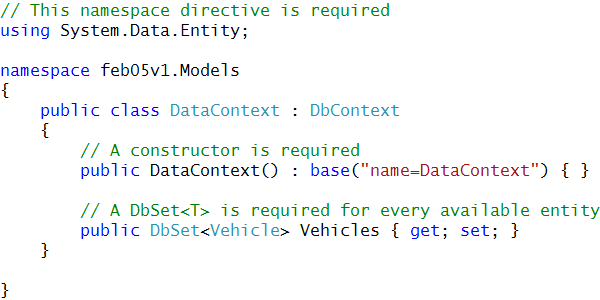 We suggest that you create a separate source code file to hold the view model classes needed for each controller. For example, assume that you have a “Suppliers and Products” application domain. Therefore, you should create a source code file named “VM_Supplier.cs”, and another named “VM_Product.cs”. What classes do you write? The answer is dependent upon your app’s use cases. However, there are some common and obvious use case patterns. 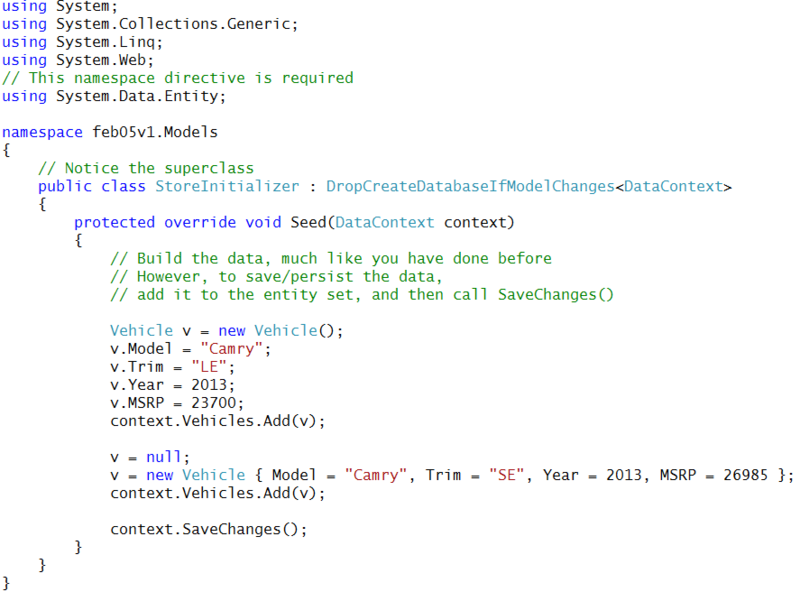 Follow these suggestions as you write view model classes for your first few apps. As just stated above, assume a “Suppliers and Products” application domain. A supplier can have zero or more products, and a product is always linked to one supplier. Conversely, you may need more classes to handle some use cases. Don’t be afraid of that.